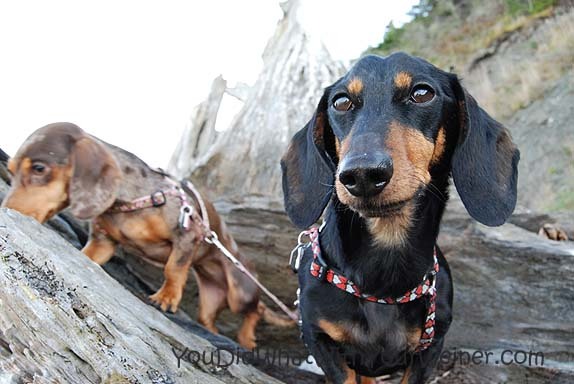 This last weekend we went to Port Townsend to walk the beach with my Step-Dad, Guest Adventureweiner Sadie and her Mom. 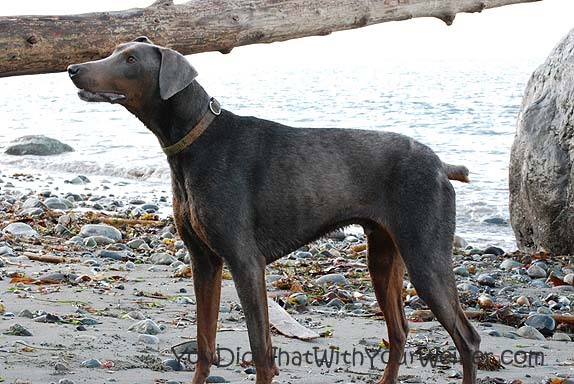 Sadie’s Mom brought two dogs – Sadie and a Doberman named Smokey. 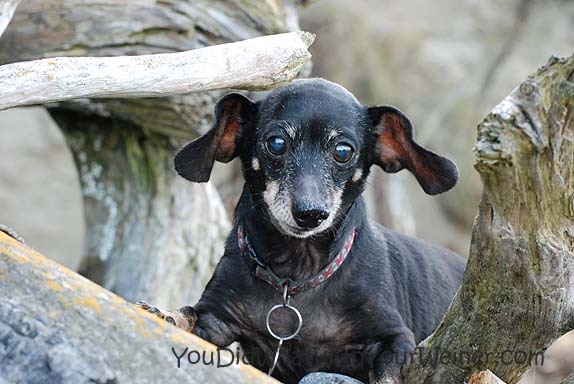 Sadie is very old and wise so she is allowed to walk off leash. Smokey is also allowed off leash so he can obsessively chase the rocks thrown into the water for him (he doesn’t wander far from the hand that throws the rocks). As usual, Chester and Gretel were on a leash. Also, as usual, Gretel was pulling with the strength of an Ox. She loves chasing throwy things so she was pulling hard to try and run with Smokey. She was basically running in place and leaving claw marks in the sand. She was also pulling so hard that her harness was squeezing her little chest and causing her to wheeze. I finally decided to take a chance and let her run free. I figured there were three of us walking the beach to watch/chase her. Also, she was somewhat constrained by the bluff and the water. I left her leash on though. If she runs away, trying to catch her is like trying to catch a greasy Jack Rabbit. If the leash is trailing behind her, I can get close to her and then stomp on it to stop her. It has only been a year since we adopted Gretel so we are still learning her personality. Recently, I figured out that she has two barks. She has an “I’m alerting” and “playing” bark that sounds like a big dog voice coming out of a tiny body. She also has an “I’m excited” or “I’m anxious” bark that sounds like a sea bird tweeting or chirping. I used to think that every time she chirped or “sang” it was because she was scared but have since learned different. The lesson for me has been to figure out when this chirping means “I am excited and this is crazy fun” or when it means “I am anxious and scared so please go away.” Today, while she was chirping at Smokey chasing rocks, it was pretty obvious she was having fun. 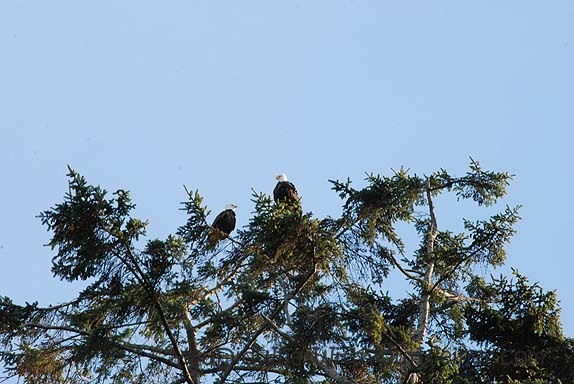 On our walk, we passed a tree sitting on top of the cliff where two huge Bald Eagles were perched to survey the beach. At one point, Gretel got a little ahead of us. I was just chatting along and all of a sudden Sadie’s Mom anxiously called out to Gretel not to get too far ahead. Seconds later, one of the Bald Eagles flew over our heads. Gretel has slowed down and was pretty close to us again so I wasn’t worried but I bet she looked like a yummy sea bird or rabbit to that eagle. 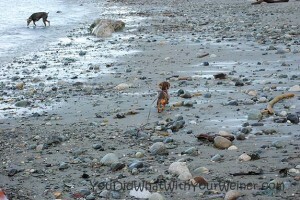 As we continued to walk and chat Gretel kept close, dragging her sandy leash behind her. I can’t say what it was but something made me stop in my tracks. I looked around and didn’t see Gretel. My heart sank but then I heard a chirp from behind us. I walked back down the beach a few hundred feet calling her name. 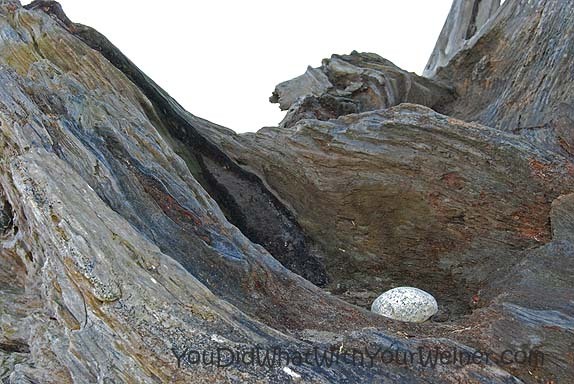 She is the same color as wet driftwood so she was a little hard to see but there she was standing by the cliff with a worried look on her little crooky face. Apparently she wandered into the drift wood and her trailing leash had gotten caught under a piece of wood. We had such a great day. The weather was amazing and the conversation was great. Gretel got to run free as a bird and play to her little hearts content. I also got some great photos. Yay!! Gretel got to be free on the beach!! My Mum hasn’t tried that with me yet, cos I chase pretty much anything that moves (well I am a SheepDog) and she says I go into ‘the zone’ and don’t listen to her! I think I’m getting better as I get older, so hopefully one day I’ll get to run free just like Gretel and the others!! Sounds like you guys had a great trip! The first time I let Sasha off leash on a beach it was the most adorable thing ever! She looked at me for a few seconds and then realized that she was free and then she took off running. She ran all around sniffing with her tail wagging. She would run back and “tag” me and then run back off again. She loved it! She’s like Chester though and she looks for smelly stuff to roll on or to try to bring home with us. That is funny. With Gretel she was pulling and pulling like she wanted to run off into the sunet. After I let go of the leash she started to strain like she was going to pull. Then she realized there was nothing to pull against and just stood there. She just hung right around us after that. Keep those dogs close with eagles around. I’ve heard of them swooping down to pick up small dogs even when they are on leash with their owners. I have heard of that too. It is always good to be cautious but sometimes I wonder if that is just urban legend. Great photos, Jess! 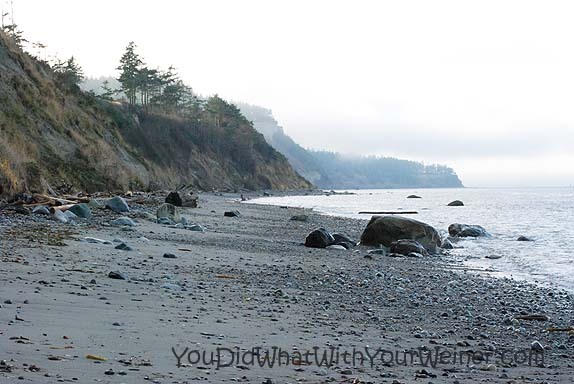 We loved Port Townsend – its a place a could have stayed a week, easily. Did you happen to check out the coffee shop – I think it’s called Under Grounds or something like that. It’s so cool! I love Port Townsend too. I spent a lot of time there growing up because that is where my Mom lived. As a teenager I spent hours and hours hanging around downtown and shopping in stores. I don’t tend to get downtown much anymore because my time is usually limited when I stop through town. I usually stick to visiting my Step Dad and friends and walking the trails and beaches. Simply stunning! What a gorgeous place to walk. I am so glad you got the chance to take Gretel and watch her run with abandon. Isn’t it wonderful to watch a dog blossom like that? Yeah. She has come such a long way. Progress has been slow and steady but all of a sudden she seems to be going through a “coming out of her shell” spurt 🙂 It feels good to know that you have a dog the perfect chance they might not have gotten anywhere else. You definitely did get some great pictures! It looks like an awesome day, and I admit it, I have beach envy! It was a really great day. That is one of our favorite beaches. Do you live by a beach? Aw poor girl! Great pictures, what a beautiful place to go. Now, about the Puppia harness (what Nola wears). It is an amazing harness, but you’re measurements have to be exact! I cannot stress that enough. Nola walks well on a leash, so control isn’t an issue very much with her. But I did have this harness while she was working on good walking. Once again, measure measure measure!!! If it’s the right fit the harness shouldn’t sag or feel too loose. 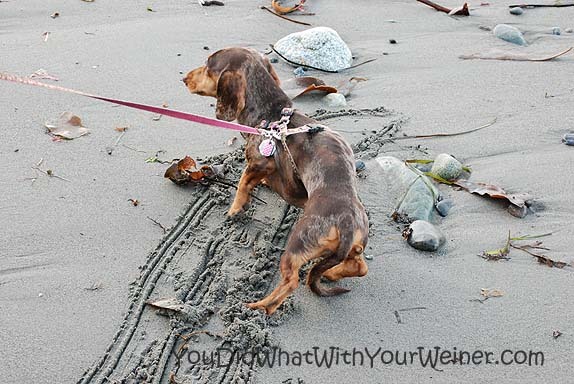 A tip a Doxie friend gave me: wash the harness every couple of weeks, laying it flat to dry. It tightens the harness right back up and it comes out looking new! Also, make sure you get Puppia, not just a mesh harness. I really really recommend them. Hope this helps. 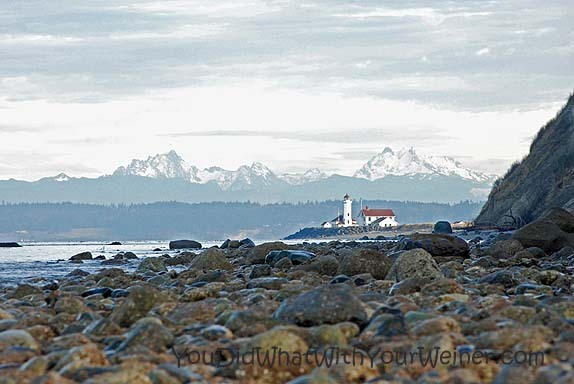 Stopping by from the Saturday Pet Blogger Hop and had to comment on this post since I used to live in Port Angeles and love the Olympic Penisula. Love the picture of the Bald Eagles. Beautiful. I lived in Port Angeles and Sequim for about 5 years. It was before doggies. I worked at Olympic National Park. That was a great job! Love me some Frugal’s too?